Edible Arrangements® in Afton Village is owned by Amardeep Singh and Sukhchain Jassal and operated by their store manager Chad Pentoney. We have a fresh fruit bouquet to make any occasion special – from birthdays, anniversaries and congratulations to business events and client gifts. Our bouquets are made fresh with premium fruit arranged in a variety of stunning displays. Each bouquet can be complemented with chocolate dipped fruit including dipped strawberries, dipped pineapple daisies, dipped banana slices, dipped Granny Smith apple wedges and more! 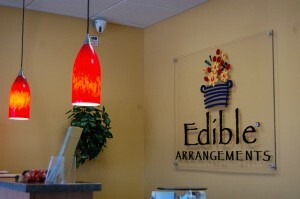 Make every occasion special with Edible Arrangements®. Edible Arrangements® is on the summer upswing! We will now be offering all of our premium dipped fruits and arrangements with the limited offerings of our summer fruits; watermelon, kiwi, mango and now blueberries! Like our Watermelon Kiwi Bouquet that sports our sunshine shaped pineapple, honeydew, cantaloupe, watermelon ball sticks, kiwi slices, strawberries and grapes. This is our most popular summer arrangement and now you can add blueberry sticks in as well! We also have a great new topping and some coming soon arrangements! With our large variety and personalizing options come in or give us a call and we can make any of your summer plans spectacular! For ordering, either call or click HERE.